Domotex, Domotex, Domotex! But first, hello everyone, how are you? I'm getting ready to board a train to Berlin to work with Jonathan Adler and his team to help kick off his new brand in Germany, Jonathan Adler Germany! If you are in Berlin and would like to come, you can certainly join us - more information here. If you cannot make it, be sure to follow my @decor8 Instagram and Instagram Stories starting today to see what we're up to with "the" Jonathan. BUT FIRST. Domotex and my first impressions. If you have been following me on the blog or Instagram, you know that I had two lectures, each followed by moderating a panel of experts who are bloggers but also book authors, stylists, trend experts, and photographers. It was quite an amazing group and I'm so proud to say that our talk shows were a success. I was excited to read the enthusiastic response yesterday in the Domotex press release, pay special attention to pargraph 7, in ENGLISH or in GERMAN. The morning session was an hour with 15 minutes of audience Q+A and the topic was, How To Collaborate With Bloggers To Market Your Products. 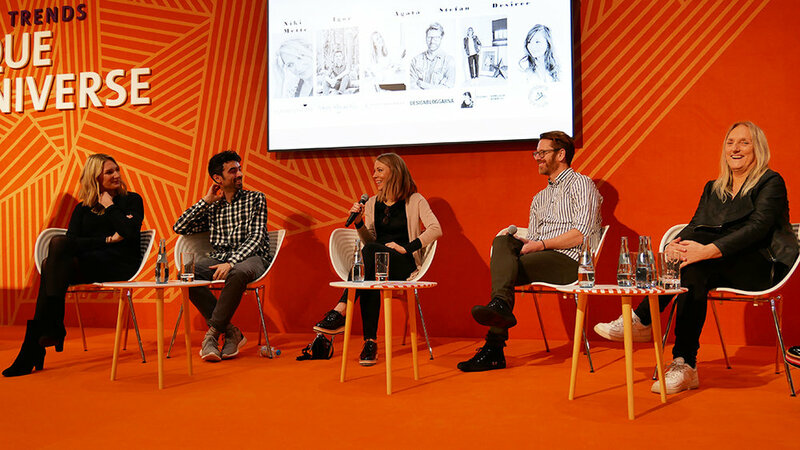 I spoke for 30 minutes and then I moderated a panel that included Niki from My Scandinavian Home, Igor from Happy Interiors blog and Urban Jungle Bloggers, Agata from Passion Shake, Stefan from Trend Stefan, Desiree from Vogesparis and Mette from Monsterscircus. This was a wonderful and very diverse and international team to work with - all ages, differing skillsets, etc. yet we all felt the same on this topic and each had a very interesting perspective to share based on their own experiences using social media daily. Here are a few of my slides from that presentation to give you a taste. The first part of my presentation simply asked, Why Bloggers? And then I answered, "Why Not?" with 8 reasons. I broke down 8 key reasons why brands should work with bloggers: TRUST, POWER, RESOURCE, ENGAGED, TARGETED, ADVOCATES, SEO, CONTENT. I am very data driven, so I did a lot of research first to get the right numbers and I found this slide especially good for my audience to see. After taking the audience through 8 reasons why brands should put some of their advertising dollars into bloggers and influencers, I explained quite thoroughly WHO they should work with because not all bloggers are equal. This was the best slide in my presentation because I said what I really believe brands needed to hear the most. There is still a lot of confusion around how to work with bloggers, but after this presentation followed by the panel and then the Q+A from the audience, I am confident that everyone left with a good understanding of how to work with professional bloggers. In this part of the presentation, I broke down the different things that bloggers offer. After all, it's not just a post on our blog anymore! I covered everything from underwritten posts to shop this post on Instagram and beyond, though I know from 12 years of experience that to really learn how to work best with a blogger, a brand has to ask the bloggers they have their eye on and see what the blogger has experience with and what they feel would fit your brand best. In other words, you really need to develop a good relationship between blogger and brand and go from there. Next, I talked to each blogger on our panel, and I asked them questions about who they are, what they do, how they work with brands and so on. It was a lively and interesting conversation to have first thing on Friday morning, opening day, but fortunately we had a great breakfast and the seats were full with interested, curious guests, so we were very excited to be there sharing our expertise with the crowd. Finally, after the bloggers shared their bios and experiences, we took questions from the audience and then, it was a wrap! 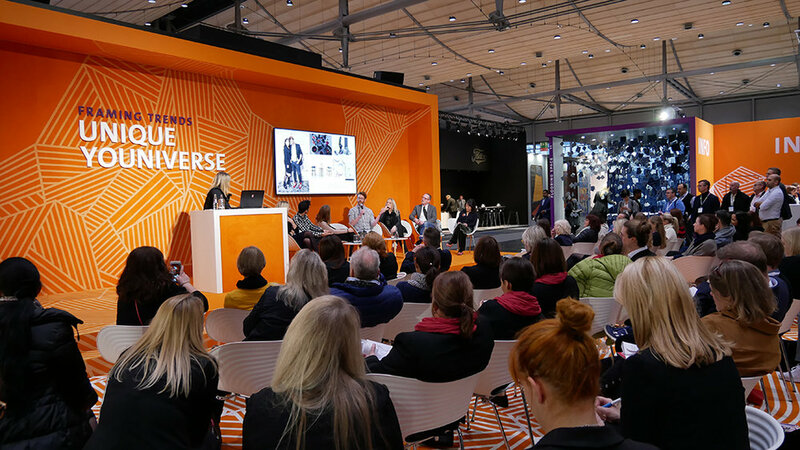 In the afternoon, I had another lecture and then, moderated a panel of, this time, 7 bloggers since I'd invited rug expert, Michael Christie, to the stage to take part in our "Trend Talk Show". In the first part of my presentation, I shared with the audience a slide for each member of my panel, and also included one for myself, profiling the blogger. After making all of the introductions and bragging about my fabulous panel, I then went right into the slides featuring mood boards that gave the audience something visual to follow as we spoke about the trends for 2018. I spoke about my three slides and then, I let each blogger talk about their slides - each blogger had an average of 3 slides to talk through. Lots of people were taking photos of the slides on their phones, so I believe the audience really enjoyed what we had to say. I wrapped up the presentation and that was that! It felt good to be finished with both presentations (I must say!) but now, looking back, I want to moderate more panels at fairs again because I love it! This was my first time as a moderator, I usually stand up along and give lectures. After, the general feedback was that the audience thought I'd been a moderator for years. That was a lovely thing to hear, and I'm glad I went for it. I love public speaking but even more, with a panel, so this is something I hope to do more of in the future, interviewing on stage, video work with interviews, panel moderation, anything that gives me a chance to be social and open up people and make them laugh a little as they learn a lot - this is my passion. I guess that's why I got into blogging and teaching in the first place. So that's my first impressions from Domotex - I'll be back on Thursday with more. I'm in Berlin for a few days, so please follow me on Instagram - I'm sure you will be inspired by my trip and the things I do there. THANK YOU DOMOTEX for everything! Have a lovely Tuesday! Oh, and I'm over on Sotheby's if you want to read, "Decor8’s Holly Becker Shops Emerging Design Talent". Thank you Sotheby's for the interview!